Apples and spice and everything nice! 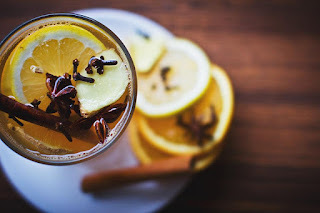 This is a very easy seasonal beverage that’ll be sure to please this fall. Peel the orange and save the peeling. Combine apple juice, spices and orange peel in a medium saucepan. Bring the mixture to a steady simmer’ then set aside for 30 minutes to let the ingredients steep. Strain, pour into a mug and top with anything you’d like! A few favorites are: whipped cream, cinnamon stick and vanilla ice cream. For a cocktail version add your choice of bourbon or spiced rum and enjoy!